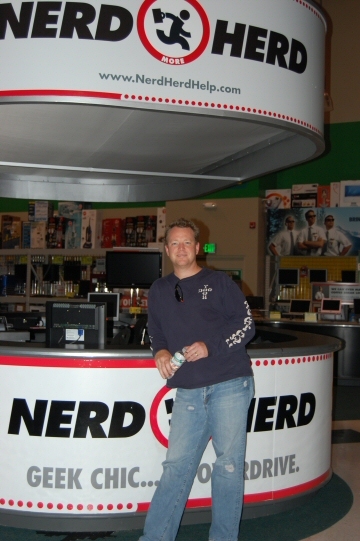 on the set of Chuck. New Robbie Interview! io9.com has just posted a new interview with Robbie about his transition from actor to one of the directors and producers of Chuck. Watch Chuck on NBC! Robbie currently works as an executive producer and director on Chuck, the critically acclaimed comedy-adventure series about reluctant CIA agent Chuck Bartowski. Chuck can be seen Mondays at 8:00 p.m. Eastern / 7:00 p.m. Central time. Robbie's upcoming television appearances can be viewed at TV Now. Robbie has no public appearances scheduled. Please Note: All of Robbie's public appearances are subject to his professional commitments. If a convention is not listed in this space, Robbie has not confirmed his appearance for that event. Autographs and Fan Mail: Robbie wants his fans to know that as much as he truly appreciates the amount of fan mail that comes his way, it has come to a point that, due to the demands of his work and family schedules, responding to this mail has become too overwhelming for him to manage at all. Robbie is thus unable to continue to respond to fan mail personally or to autograph items by mail. He hopes that everyone will understand his reasons for this situation. Robbie is happy to sign for fans at conventions and similar public appearances. Autographed photos of Robbie as himself and as Tom Paris are available for purchase at a nominal cost through The Store for fans unable to attend a convention. If you have any suggestions or want to contribute a photo or other written material, drop the webmaster a line at webmaster@robertduncanmcneill.net. If you're using AOL to access the site and the graphics aren't what you want them to be, you need to change the settings on your internet preferences from "compressed graphics" to "never compress graphics." For information on this problem, as well as instructions for a solution, visit AOL's Distorted Graphics.